First, I’ll like to thanks Audio Hub for the opportunity to audition the Tiny Tube DAC. This little USB DAC is co-developed by Audio Hub and its Chinese partner which handles the production. 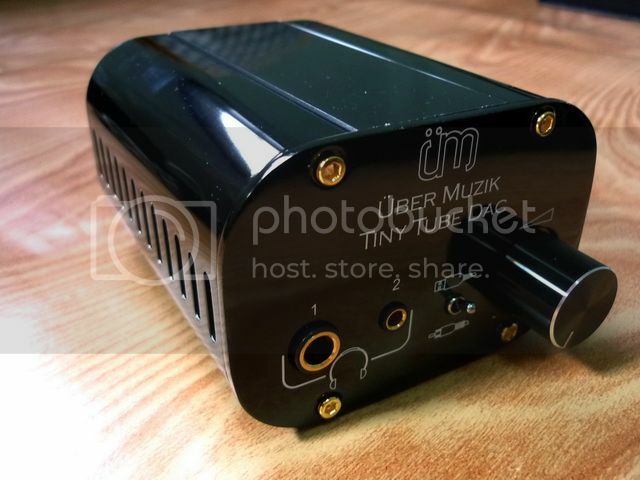 Audio Hub on the other hand handles the sale and marketing under its own brand, the Über Muzik, which will expand to other tube gear including an upcoming desktop tube amp as well. 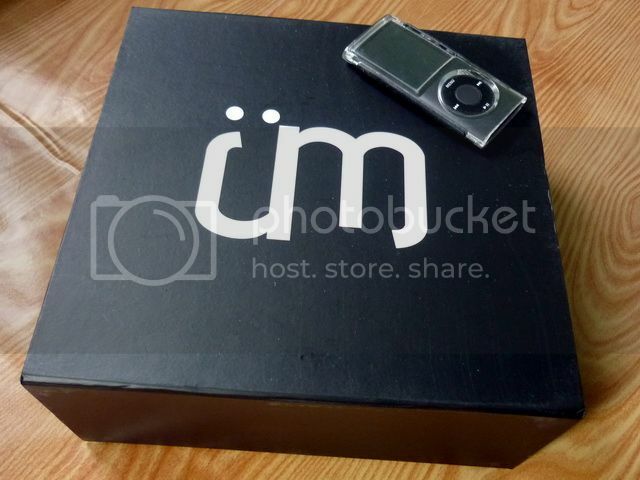 iPod Nano 4G as size reference. I remember just a few years back the market was stuck with a good amount of TI’s PCM270x based USB DAC, at least for the low end market (*yet some were priced not so low end). While a few of them are quite decent sounding, the majority is pretty plain by today’s standard. Nowadays the much more sophisticated 24/94 or even 24/192 solution has became a common place for USB DAC. The DAC chip inside the Tiny Tube DAC is the relatively unknown, 24/48 supported UAC3553B from Micronas. A little research into the DAC chip has yielded very little detail. It is quite an old chip and even Micronas doesn’t list it on its website anymore, but nevertheless it still looks quite decent based on what little spec it does have floating on the internet. One of the things I like about the UAC3553B chip is its ability to support 24bits directly on USB (which it also handles). Quite a few of the small USB DAC in the market can’t handle 24bit not because the DAC’s limitation, but because the USB receiver chip can’t do 24bit. Instead the users often have to use S/PDIF connection to get proper 24bits support, which defeats the idea of getting them as an 24bit USB DAC in the first place. Of course there is still the discussion on whether 24bit sounds better than 16bit – but that’s is a discussion better left for another time. 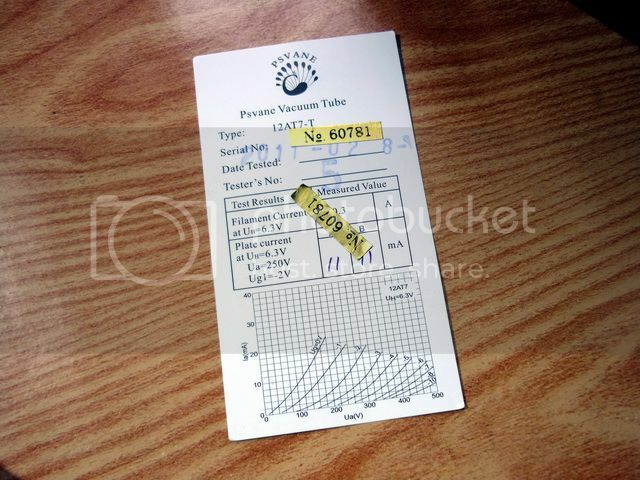 The tube comes with its own test certificate and serial number. After the DAC chip, the signal is buffered with a Psvane 12AT7 tube before going into the headphone amp section. For those who don’t know, Psvane is actually marketed as a premier tube brand from Shuguang. One Psvane 12AT7 tube usually goes for $40+ on the web but most of the time two are sold as a matching pair. Since this is a fairly well regarded tube, I guess tube rolling is probably no required. Unfortunately I only have 12AX7 with me and it can’t be used in the Tiny Tube DAC. On the amp section’s side, it features the also well regarded TI’s TPA6120A2, an opamp designed for driving headphone upward to 600ohm and beyond, even though Audio Hub only claims a 300ohm load. In the case of Tiny Tube DAC however, I think the headphone amp section can easily handle higher load as the output is much stronger than I anticipated. On the exterior, there are two headphone-out at the front (one for 6.5mm and one for 3.5mm), an input selection switch for RCA-in / USB-in and volume control. On the back, there are the USB-input, RCA-input, a pre-amp out (one with the speaker sign), the power switch and the 12V power-in. 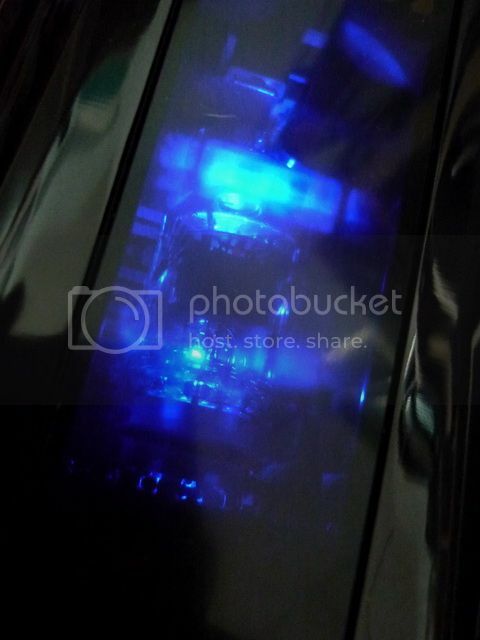 The top of the case is dark acrylic that let the blue LED shines through. The side and back of the casing has grills and holes to help dissipating heat generated by the tube, which is warm to the touch but not burning. Aesthetically there is nothing to dislike about the design of the DAC, except perhaps the blue LED. It should have been orange red since it is the color of growing tube after all. 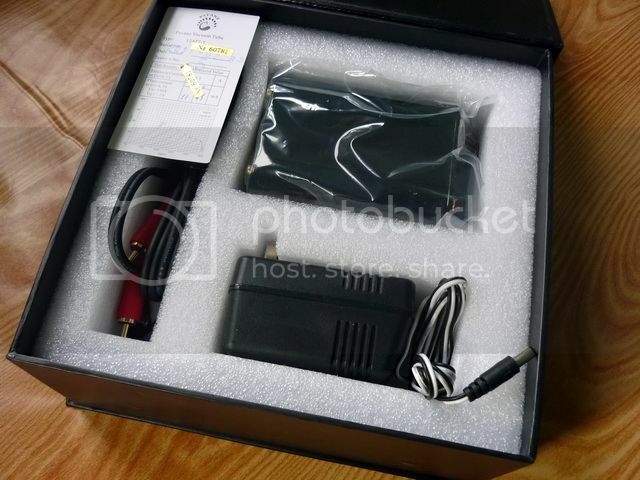 Do note that the DAC itself comes with a 12V DC 800mA adapter that only works with 240V AC at the moment. 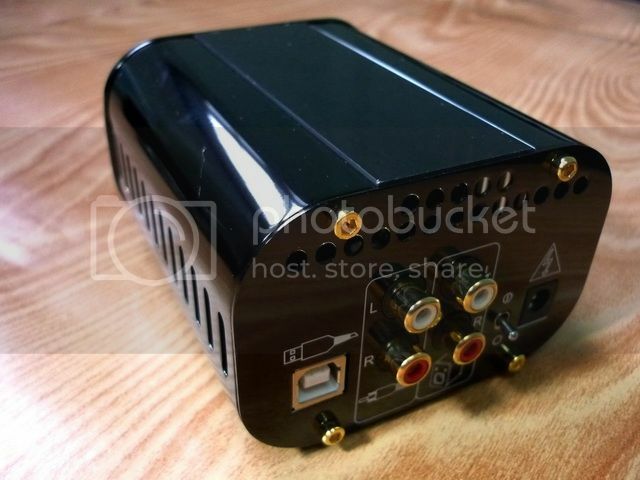 I am not sure if Audio Hub has any plan to sell an 110V AC version or not. If not, you will have to source one yourself. Overall the DAC with the adapter is a little sensitive to dirty power. It does really hiss much but it is sensitive to electronic appliance that shares the same (or nearby) power socket and occasionally will reset the USB connection when they are turned on or off. Not a big deal but it is thing to note when you are trying to find it a power socket. Being mainly a portable user, I don’t really have any other desktop USB DAC of same class to compare to Tiny Tube DAC. But for what it worth, I did listen to it along side with NuForce uDAC (headphone-out), HifiMan HM602 (as USB NOS DAC) and HM801 (24/192 DAC coax-in fed by uDAC) using Yuin PK1, HifiMan RE262, Fischer Audio FA-003 and Grado SR325i. The first thing I notice is the dark background, which is something not to my expectation where tube is involved. It creates an openness in the soundstage that is better than any DC I have heard so far, even compared to HM801. It is not that HM801 has a limited soundstage. In fact I always regard HM801 as having one of the best soundstage on any DAP I ever heard. But it does carry a warmish tone in the overall presentation that surrounds the listener. The Tiny Tube DAC on the other hand tends to let the ‘audio space’ faints into the dark background as if there is no ending. Between all the DAC I listened to, I often find the NuForce to be most ‘digital’ sounding, that’s if you can acknowledge the existence of such a thing (and some might refer it to be ‘accurate’, depends on the view). HM601 with its NOS DAC is of course on the other end with a vey ‘analog’ or musical sound. HM801 is what I consider to have the best of both worlds, musical yet also technically strong. The Tiny Tube DAC is perhaps closer to a digital sound than it is to an analog sound. It is clean and sparkle on the treble with a slight edge that feel a lot like the NuForce but at the same time there is a unique touch of lushness in the mid that makes the presentation more effortless and relaxing, but not obviously warm or full. 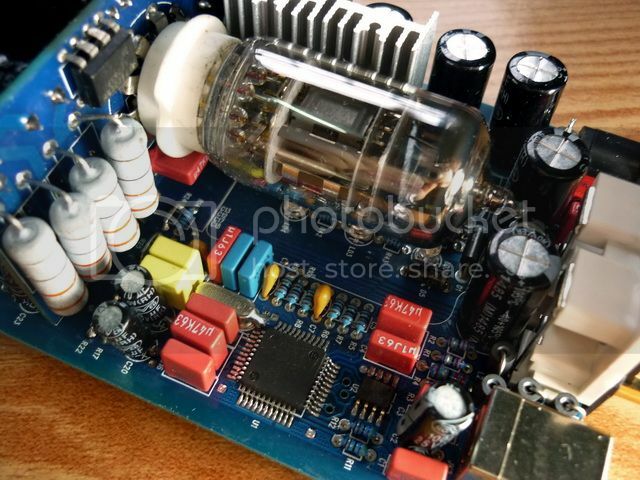 If there is ever something magical about putting vacuum tube into a DAC, I would say that could very well be it. Bass is where Tiny Tube DAC suffers a bit where it has a much softer impact and shallower body than all other DAC in comparison. Even uDAC, the most compressed and congested sounding in the group, has better bass impact and tightness though completely lose out on other qualities. Performance wise, Tiny Tube DAC just seems to lack the ability to drive each note as well, as full, or as deep as HM801. On the other hand, it is quite comparable to HM602 even though the two are almost opposite of each other. While it might not be the best DAC for bass heavy music, the overall tonal balance is still very decent. Synergy wise, neutral to warmish sounding headphone tend to pair the best with Tiny Tube DAC, as in the case of HifiMan RE262 and Fischer Audio FA-003. HM602 on the other hand is better with PK1 and SR325i. One of the main issues I have with Tiny Tube DAC is its high gain and output. While it can probably drive 600 ohm headphone just fine, it is bad news for IEM or any headphone with low impedance and high sensitivity. For most of the ‘regular’ low impedance IEM I tested on Tiny Tube DAC, the majority can’t get pass 8 o’clock on the dial when the software volume is set to full on the PC. In situation like these, the imbalance of the pot makes the IEM either missing one of the channels when it is too low or becomes overly loud when the volume is turned up just a little bit. The only way to get better volume control is to reduce the PC setting by almost half. As I was told, the new batch of the Tiny Tube DAC will have 33ohm resistor implemented on the 3.5mm headphone-out to cut down the gain for IEM. You can still use the 6.5mm headphone-out for those harder to driver big cans. Though it is called a DAC, the Tiny Tube DAC can also serve as headphone amp if you use the RCA-in. The headphone-out is actually quite good in all regard and doesn’t seem to have the soft bass issue (which likely to originate from the DAC). Consider that the newer Nuforce uDAC2 is priced at $130 and the few other tube buffered small USB DAC are in the US$200+ price range, the Tiny Tube DAC with its Psvane 12AT7 is quite competitively priced at SGD$250 (= a little over US$200). Well worth a look if you are in the market for a good sounding small USB DAC with some tube action!